It’s that time of year again – Valentine’s Day. How does that feel? For some people it’s filled with lovey-dovey romance, and for others, it can feel really painful. Why is it that one day every year we go consumer-crazy over romantic love? It makes no sense really, as love is around us all the time! We might not always see it, and if we’re nursing a broken heart, then this supposedly ‘special’ day can seem really ‘rubbish’. Underneath that, though, is the truth that our true nature is love. We are innately lovable, and there is more love available to us than we think. So why can’t we always see it? Read on, and in this article we’ll explain why your heart can never really be broken, even when it feels like it is. And, for the times when you can’t see your truly lovable self, there are a whole host of essential oils that you can use to help you make Valentine’s day a day of real self-love and self-care. Let’s start with a few nice deep inhales and exhales, and notice all of the beautiful things about this particular moment. How much nicer is it now you have taken a few steps to care for yourself? Keep breathing – you’re going to get through this. Now, I know I’m making a bold claim here about the fact that you can’t really be broken-hearted but stick with me. 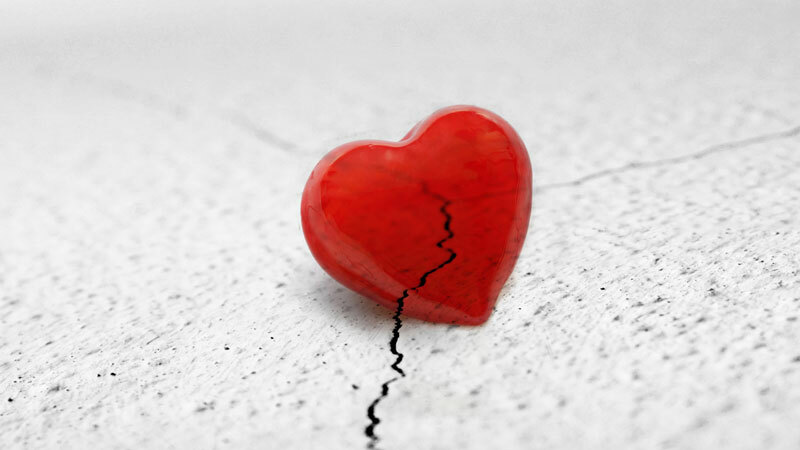 I know you might be feeling broken right now, especially if it feels like everyone else is happy on Valentine’s day…. but I’m going to explain to you how I see it differently. Our feelings come from our thinking, moment to moment. Our experience of being broken-hearted therefore also comes from our thinking. On Valentine’s day, our thinking goes into overdrive because more than likely we are comparing ourselves to others, as well as looking at our situation negatively. If you’re dealing with a broken heart, it’s more than likely that life had this planned for you – and that there’s something to be learned from being here. More than that - if that’s still not reassuring you - we so often attribute our happiness to others, but the truth is that it comes from within us. We don’t need other people to be happy. Let me assure you that this is the truth! We were born alone, and we were born with love, because underneath everything that’s who we are. All we need is self-love – and if you’ve got this far, then you’ve already begun that process! The even better news? We don’t have to find self-love – it’s already within, we just need to access it! And that, my loves, is why your heart can’t really be broken. Because you fulfil it all by yourself (and hey, maybe that’s something the Valentine’s celebrators haven’t even realised?). So, let’s start exploring how we can enjoy some beautiful self-love aromatherapy rituals to really pamper ourselves – and that’s for life, not just for Valentine’s! Below are some ideas, supported by essential oils, for you to enjoy. Why not journal about how you feel doing each one, and get in touch with what you love? Firstly, whether you’ve tried it before or not, why not give a little self-meditation a go? You might want to create a meditative spritz before you start, so grab a spray bottle for this one, and spritz it into the room and around your aura during meditation! Meditation Spritz: Mix 100ml Lavender Hydrolat, 15 drops Patchouli essential oil, 10 drops Neroli and 5 drops Myrrh in a spray bottle, and spray as desired. All you need to do is sit quietly for however long you feel and notice what thoughts come up. There’s nothing to do with your thoughts, but observe them and see what patterns show! Are there any habitual thoughts that come up about your capacity to be loved? Remember you are already loved – it is your true nature - and let it go! You can also take this meditative practice outdoors. Why not take a mindful walk in nature, noticing all the things you love that surround you? For this one, you can take an Aromatherapy Rollette with you and roll it onto your pulse points as you walk. Nurturing Rollette: In a rollete bottle mix 1 drop Geranium essential oil and 1 drop Lavender in 10ml of Sweet Almond or Grapeseed oil and apply to pulse points on the neck and wrists as you walk. Keep your awareness focused on the present moment, notice the feeling of your foot as it places each step on the ground, and notice how the air feels moving across your face. All you need, you have in this moment. Follow the nice feelings! When you’ve had a nice walk, you might want to follow it with a relaxing bath! You can make a bath a beautiful self-love experience; light a candle, play some soft music, turn off your phone, shut all the doors, run a warm bath and add the following aromatherapy bath salts, swirling gently to dissolve. Bathtime Salts: Mix 3 drops Rose essential oil, 3 drops Frankincense and 2 drops Bergamot into half a cup of Himalayan Pink salts. Stir well, and add to a running warm bath. You might also fancy a little bit of self-massage. This is a great ritual for self-love. Massage Blend: Grab 15ml of carrier oil (such as Grapeseed or Sweet Almond), and mix in 2 drops Rose essential oil, 2 drops Melissa, and 2 drops Neroli. Massage into your body in a direction towards the heart and allow it to sink in and nourish the skin. You might want to rest after – perhaps enjoy a nap, or read a book - and let the oils work their magic! If you’re the type of person who likes a little more physical movement, then why not try some yoga? Yin yoga is very nurturing, relaxing and gentle, and helps you dive inwards into self-enquiry. Why not get a DVD or try an online class – and diffuse some supportive essential oils in the background? We recommend Yoga with Adriene: and her Intro to Yin Yoga at home. Yin Yoga Diffuser Blend: diffuse a beautiful blend of 3 drops Rose, 2 drops Patchouli and 1 drop Vetiver in an electrical diffuser or candle burner during your practice. This beautiful slow flow will help you tap back into the magic of this moment, and remind you of your own inner beauty and the fact you already have everything you need within you! You may have noticed that many of our self-love ritual blends contain Rose. That’s because Rose essential oil is a very special oil for helping with feelings of being broken-hearted. An emotionally supportive oil, it helps release deep trauma, grief and loss, balances the heart chakra and generally uplifts and soothes emotions. Try it in the special blends listed above or get creative and combine it with other oils that you love. Follow that special feeling of self-love in oil selection and regain your intuitive powers. Although Rose essential oil is incredibly expensive, it is highly concentrated, so you only need very small amounts for each treatment. We sell pure Rose Otto essential oil and Rose Absolute and also offer both oils diluted at 5% in Jojoba for a more affordable option. Both of these 'light' oils can be substituted into any of the above blends. Whichever oils you go for, remember you have everything you need already within you to regain your happiness. You are love; you just need to remember, and our rituals will help you to do that. We’re with you every step of the way! Grab your oils from our website and join us in our Self Love Movement this Valentine’s Day!